Voyager and Stormforce Indoor / Outdoor Cover available for the Defender, Discovery,Freelander,Range Rover Classic and New Range Rover and Sport. 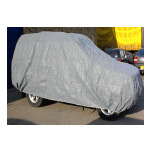 See details Land Rover Cielo Outdoor Bespoke Car Cover - Fully Fitted, made to order. See details SOFTECH Luxury Land Rover or Range Rover Indoor Bespoke Cover - Fully Fitted, made to order. See details Land Rover ADVAN-TEX Waterproof & Breathable Outdoor Bespoke Car Cover - Fully Fitted, made to order.